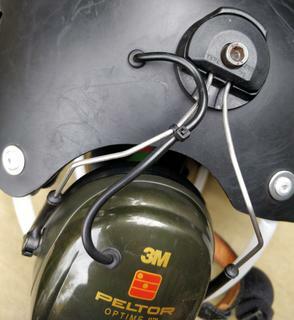 For PPG flying I use generic skateboard helmet with Peltor earmuffs fitted with communication equipment. I was heavily inspired by the helmet made by SP3OTZ (website in Polish only). I have taken many photos so the construction details are clearly visible. The headset works with Baofeng UV-5R and my Kobo BlueFly variometer. After almost two years of heavy use I can tell that receiving voice quality and noise muffling is excellent. The voice transmission is more or less OK but on full throttle my voice is unintelligible. This might be probably fixed by trying different microphones and amplifiers; for now the rig suits my needs. 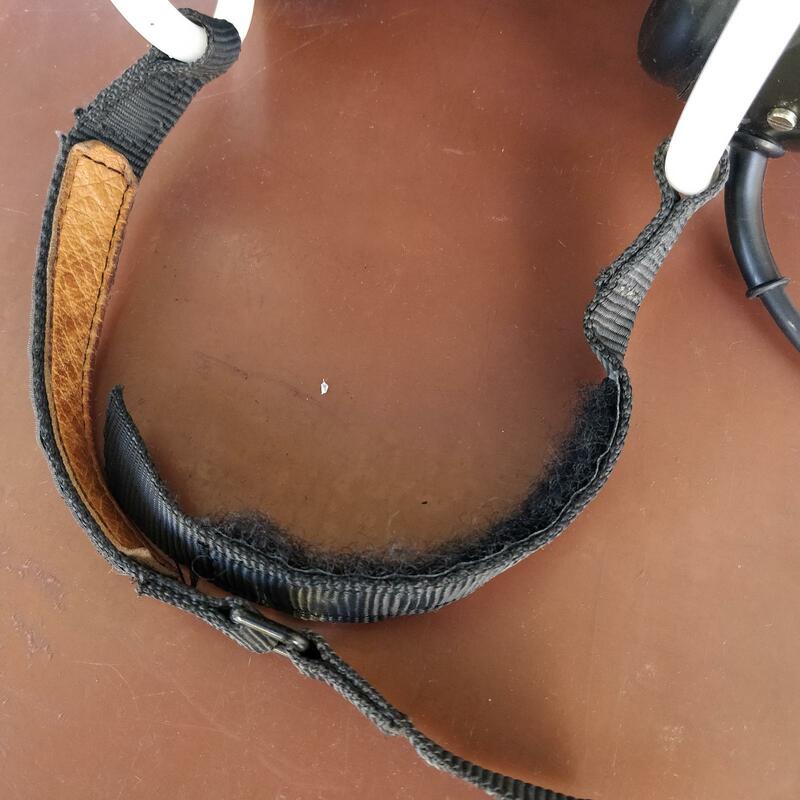 The helmet has many scratches from over two years of use. For the headset I used Peltor Optime II earmuff suitable for hard hat mounting. They claim to reduce the noise by 31 dB and are quite spacey inside, so putting the earphone inside would not be a problem. The stock earmuff contains soft foam. I cut and removed a part of the foam to accommodate the earphone. To fix the earphone in place I used a piece of hard foam cut in the shape of the earphone. 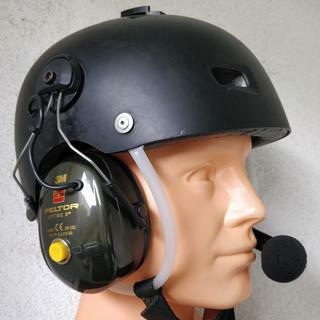 The earphone is military-grade speaker Racal 782-5393, used with Clansman radio equipment. 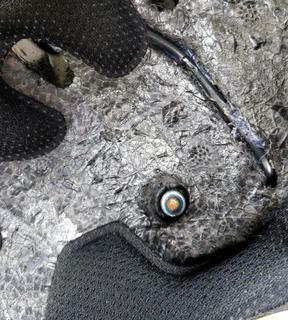 The earphone is fixed in place by specially cut piece of hard foam. 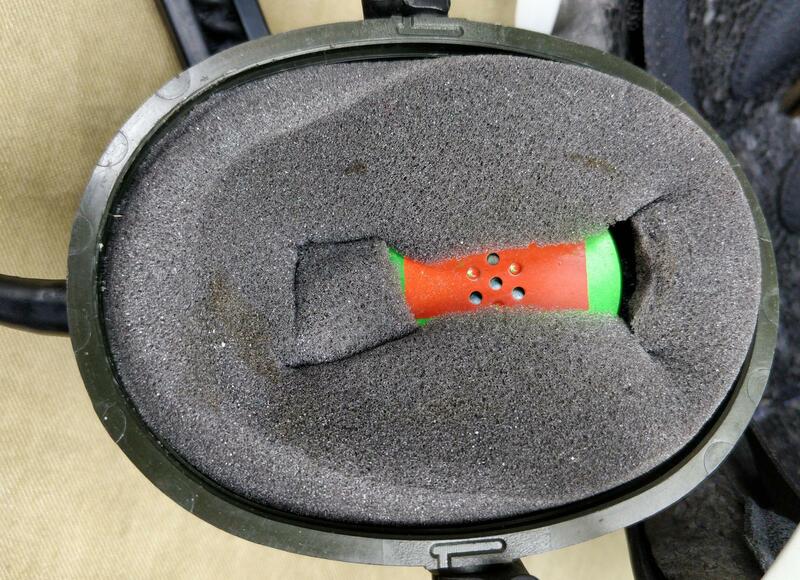 The foam is glued to the shell. A piece of the original foam was removed from the center to accommodate the earmuff. 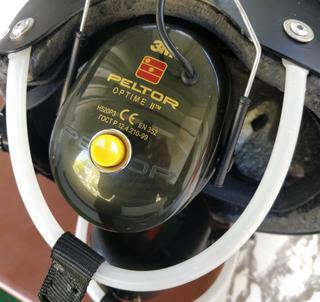 Right earmuff accommodates microphone amplifier and cable connections. The choke is put on the main wire, hopefully reducing the noise. Push-To-Talk button is located on the left earmuff. 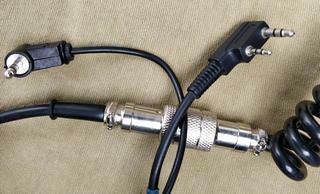 The main cable goes to the right one which also contains the microphone amplifier. The four-wire cable goes inside the helmet from the right to the left earmuff. Two wires are used by PTT button, the other two - by the left earphone. I used cable grommets so it looks quite professional. Left earmuff has PTT button. I have throttle in my right hand so it is easy to press it by left thumb when holding left brake handle. I took the whole microphone arm from a military headset bought in army surplus store. The original microphone was of electret kind, requiring 24 V power supply. 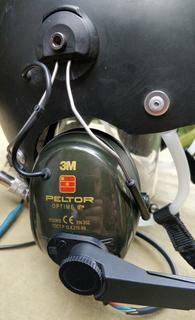 I replaced it with noise-cancelling Racal microphone similar to Russian DMSZ1. I put a foam windscreen on it for good measure. Rugged microphone arm from an old military headset. 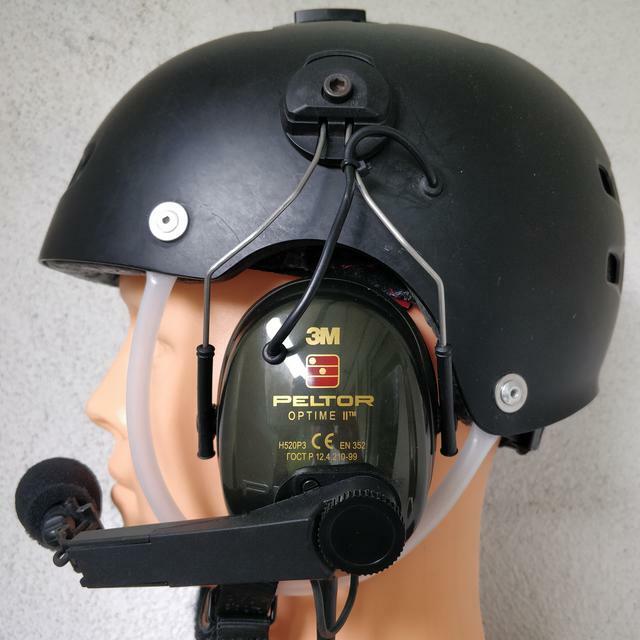 The microphone itself was replaced with Racal noise-cancelling microphone. Baofeng UV-5R uses Kenwood-compatible microphone socket, with two jacks: 2.5 and 3.5 mm. The additional jack goes to my Kobo BlueFly variometer. It enables me to hear the beeps in the headset. The dynamic microphone is accompanied with one-transistor amplifier. Double Jack plug goes to Baofeng radio. Single Jack goes to Kobo BlueFly variometer. Warning! 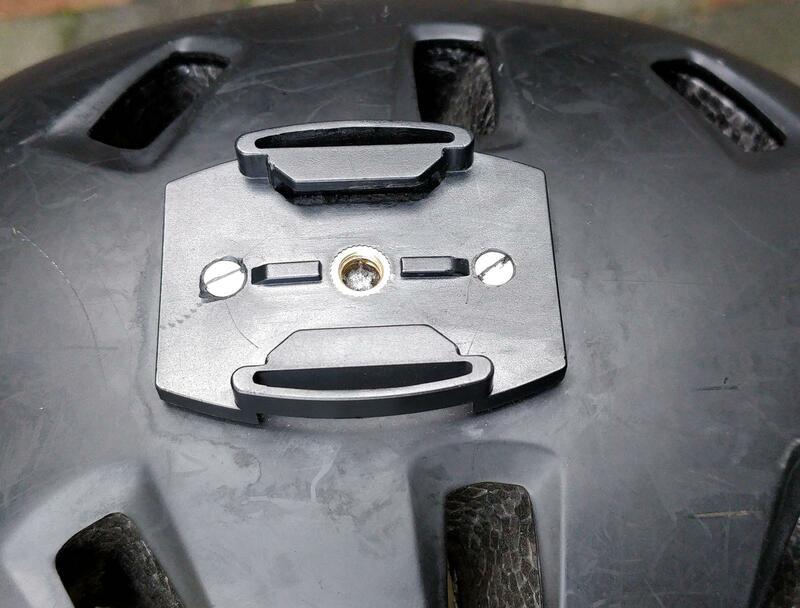 The manufacturer forbids modification of the helmet because it might lower its protection capabilities. You have been warned! 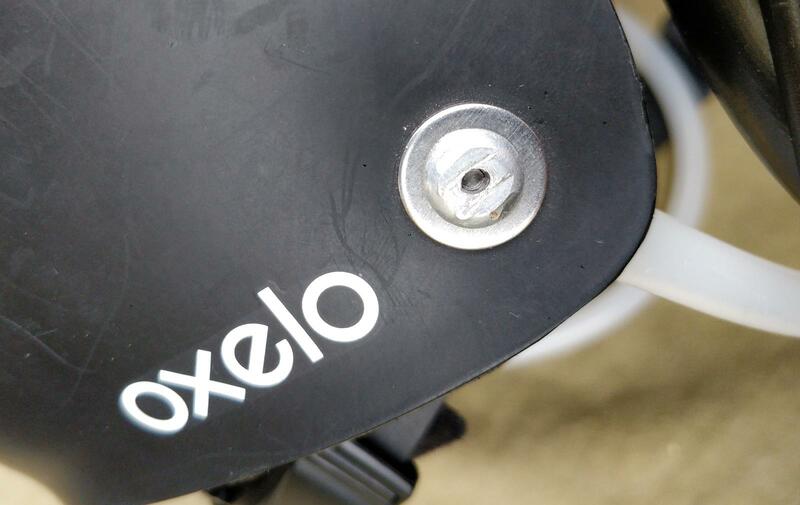 The helmet is a basic skateboarding helmet of Oxelo brand, bought from Decathlon. 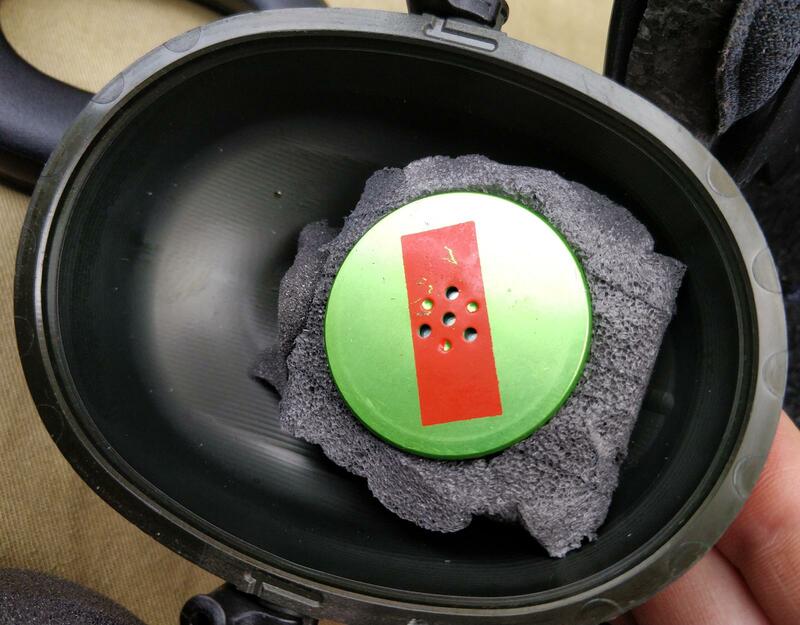 The greatest modification was the removal of the piece of the shell with the foam underneath to make space for the earmuffs. First I covered the side of the helmet with paper tape so it was easy to draw on it. Then I put the helmet on my head and looked for the optimal position of the muff. 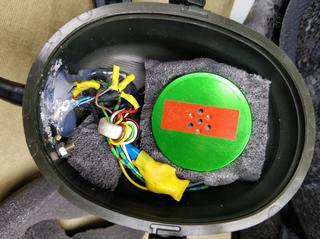 Then I marked the place for mounting hole and followed the shape of the earmuff + 15 mm. The shape was mirrored to the other side. Then I cut the shell with the Dremel multitool. I followed the advice of SP3OTZ. 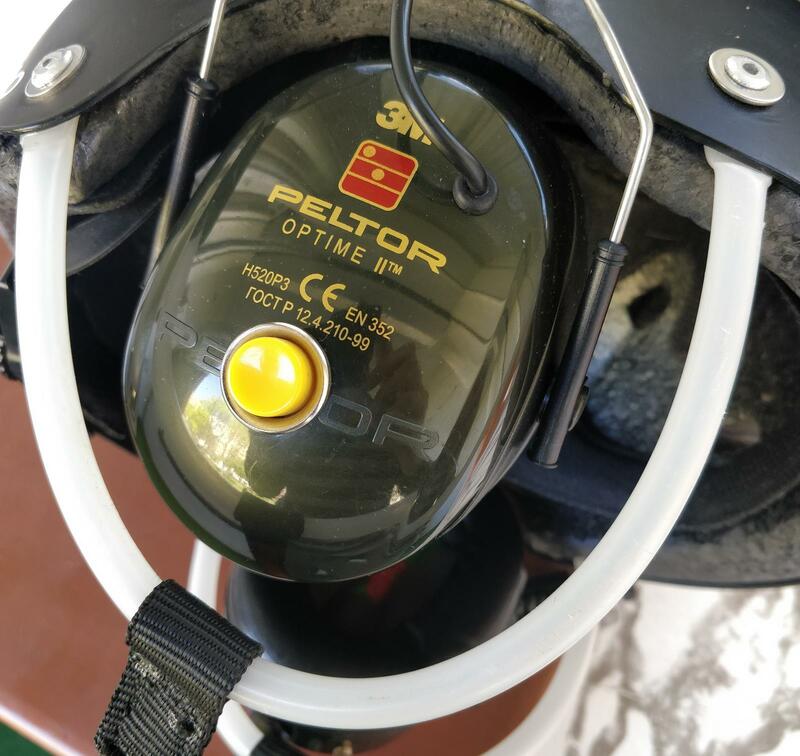 The white piece of the helmet strap is 10 mm polyethylene tubing. It’s quite rigid so it goes round the earmuff. I cut it to proper length end then flatten the ends after having them heated up by the heat gun. That made them soft and easy to flatten using clamps. Then I drilled 5 mm holes in the flattened ends and riveted them to the helmet shell. I took the strap from the aforementioned military headset. It uses velcro but in fact it holds better than the original clip strap. 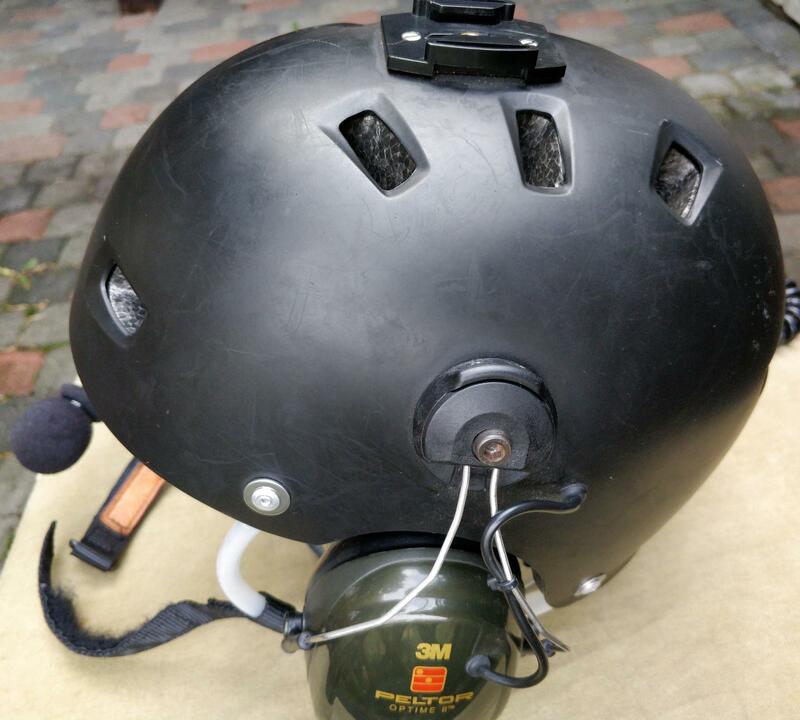 The plastic shell of the helmet was cut to accommodate the earmuff. Velcro stap taken from the military headset. 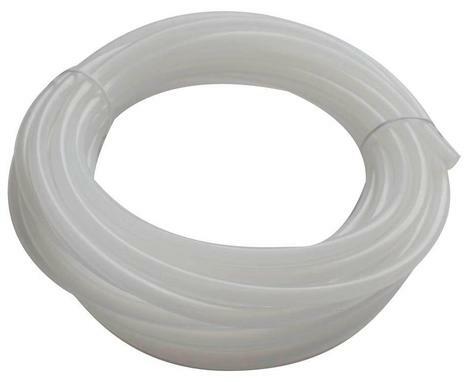 Polyethylene tubing used as the rigid strap. 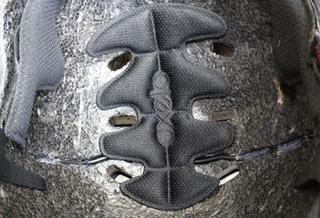 The hose is riveted to the shell. Foam inside the helmet was grooved to accommodate the cable. 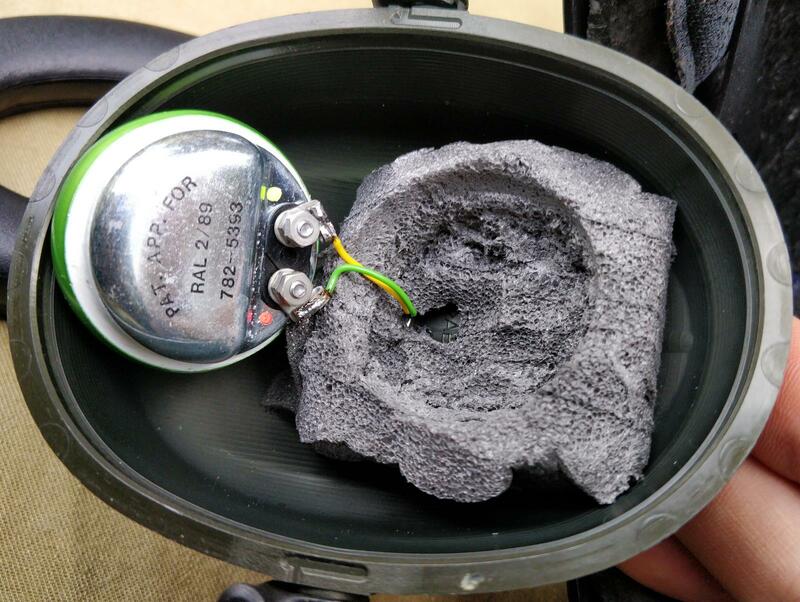 Earmuffs are screwed to the shell. It's important that the screws are as short as possible to avoid penetrating your skull during eventual impact!